The Soul Den, the full length release from Triple Point, has been out for almost a year now and features 9 original tracks, 1 cover and 3 remixes. Triple Point, founded by Dan Hinds and Vico in 1991, used sampled synth-lines and drum-beats to create their first demo, "Sublimation". From there, Dan and Vico embarked upon many projects for Triple Point including a 1996 compilation formed by the gothic/industrial magazine Permission, which brought together electro bands covering their favorite TV theme songs. Triple Point did a cover of "Dynasty" which is available on a double-CD set called TV Terror, released in 1997 on Re-constriction Records. The band also appears on Undercurrent - PDX, a compilation of Oregon electro bands put together by Doppler Effect. In 1998, Triple Point again appears on a 2-CD compilation follow-up to Undercurrent called Resurgence; and yet again on the third Doppler Effect compilation, Transcendence. 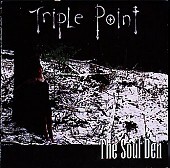 The Soul Den, Triple Point's first full length cd, creates a blend of industrial/synth music with a danceable flair with some dark undercurrents. The Soul Den also contains some very cool female vocals provided by Karen Kardell of The Razor Skyline; as well as a rather curious cover of "Holding Out For a Hero". Sonya: Who makes up the Triple Point line-up? Dan: Vico and I started Triple Point back in 1991, when we both had had enough of trying to do the band thing. Just recently, we have hooked up with a guitarist to add more depth to our sound. His name is Tom Wilcox and we just started working on some new material with him. So far, it is turning out really good - he is an amazing player! Sonya: Please explain the style of music you create. 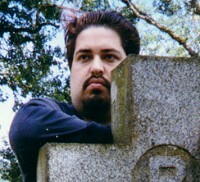 Dan: Essentially, it is a mix of gothic, industrial and synthpop. We have done some dance-oriented tracks (esp. the newer ones), but most songs are rock songs at heart. In addition, we have also done some experimental/ambient pieces, which is fun and gives the album more variety. Our music isn't as dark as most in the genre, but we try to make it very emotional and Vico's lyrics are very personal. Sonya: Who are your influences and inspirations? Dan: Speaking for myself,the biggest influences on me have been Nitzer Ebb and A Split Second. The way they used sounds and arranged their songs just blows me away. Other inspirations have been Skyclad (Martin Walkyier is the best lyricist living today says I), Devo, Celtic Frost, old FLA. Lately I've been listening to a lot of black metal, UFO, Suzanne Vega and (to lighten the mood) Shampoo and various freestyle artists like Denine and Trinere. I'm not sure exactly what Vico would list, but I know he grew up listening to a lot of stuff like The Cure, Jesus & Mary Chain, Tori Amos, Tom Waits and Foetus. Sonya: How did you come up with the name "Triple Point"? Sonya: The cover of "The Soul Den" depicts a girl tied to a tree in the snow. Please tell us how the cover concept came about, and what meanings it might hold. Dan: Vico came up with the title 'The Soul Den' and I'm sure he has his own interpretation, but this is what I got from it: The Soul Den to me is your body, at least while you're alive, but also the world at large. It is all tied together and the ropes were meant to convey that: that we are all a part of this world and everything we do affects it, just as it affects us. As for the snow, it just happened to snow the day we had set up for the photo shoot. It adds to the quality of the photos, although our model nearly froze her toes off during the shoot! Sonya: Please tell us about the gear involved in creating "The Soul Den"... I'm especially intrigued by the keyboards in "No Ordinary Psychosis"; is this track created using a standard upright piano keyboard or an electronic keyboard? Sonya: Where might readers find your music? Dan: If they would like to just hear some of our work, the easiest place is http://www.mp3.com/triplepoint. To actually purchase a CD, they can go to http://www.cdbaby.com/cd/triplepoint or come to our home page and order it directly from us at http://dhinds.home.netcom.com. Sonya: Do you have any other recordings available? Dan: We have appeared on several compilation albums over the years. Not sure if they are still available, but we were on ReConstriction's "TV Terror" as well as Arts Industria's "Silicon Warfare." We've done three comps with Doppler Effect and you can find info on those at: http://www.sonic-boom.com/dfx/home.html. Sonya: Tell us about the mix of "Stolen" that appears on the Doppler Effects compilation? Dan: Actually, "Stolen" never made the cut for The Soul Den. We recorded it and started to mix it and it just didn't come together, so we dropped it from the album at the last second. When the opportunity came up to do the Doppler Effect comp (Transcendence), I had written a new track that the vocal lines from "Stolen" just happen to fit with. The music is completely different though. The original version appears on our third demo and had guitar on it, so now that we have a guitarist, we may re-do that version at some point. Sonya: Why did you decide to do a cover of "Holding Out For A Hero"? Dan: Heh.. We've always liked to do offbeat covers and have a growing list of songs that we'd like to do in the future. "Hero" just worked out because we found a music book for the Footloose soundtrack in a second-hand book store and had talked about doing that song anyway. It's a very dramatic, energetic song and we thought it would be fun to do. It was. Sonya: Please explain "Project Sunshine"... where are the samples from, and what is the story behind this track? Dan: That track is one of the more experimental pieces and I couldn't quite get it to gel with the music alone, so I thought about adding some samples. I had been doing some online research into the human radiation experiments that the US government had done back in the 50s and managed to find a vocal sample that kind of encapsulated what I had been reading. The title came from the name of one of those experiments. Sonya: How did you come to work with Karen Kardell of The Razor Skyline? Dan: Vico and I first met her after seeing Journal of Trauma open for Switchblade Symphony down in Portland many moons ago. I was really impressed by their set and we exchanged e-mails over the years since then. We originally had someone else lined up to do the vocals on that track, but they weren't happy with the lyrics or something, so at the last minute I asked Karen if she would be interested. I would have asked her in the first place but I didn't think she would do it, so I was incredibly surprised when she said 'yes.' She wrote all new lyrics and a few days later came over for a couple hours and laid down the vocal tracks. I was blown away by how professional she was and what a great job she did. I only wish we could have recorded the whole thing in a real studio, as her voice gets a little lost in the mix, but I love what she did with that song. Sonya: Do you have any other compilations or projects with Razor Skyline? Dan: No, not at present. I haven't talked to Karen in a while actually, but I did see tRS put on a good show with Faith & The Muse this past summer. Sonya: Please tell readers about the magazine, The Plague. Dan: The Plague is the web-zine that I started with my cousin, my brother and Vico back in 1988. Originally it covered only metal, but then evolved to include alternative and industrial music as well - basically whatever the hell we liked, we covered. In 1995, I switched it from a print zine to an online one and it is still going strong. I've been doing some writing for Outburn so I don't have as much time lately, but I aim to keep it alive. It is located at: http://www.the-plague.com. Sonya: Tell us a bit about your location. Are all Triple Point musicians local to the Portland/Washington area? Do you perform locally? Regionally? 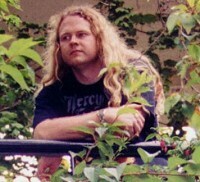 Dan: Originally, both Vico and I lived in Eugene, Oregon, but I moved up to the Seattle area in 1997. We get together a few times each year and record as much as we can during those visits. It slows things down, the distance, but we have never been the most prolific band anyway. Tom lives here and actually works at the same place I do, so at least we can work on music on a more regular basis. So far, no live shows. It would be too hard to rehearse and pull off a decent show right now, but we would like to perform live at some point. Sonya: What is the status of Triple Point today? Dan: Well, The Soul Den has been out for almost a year now and we are still trying to get it out there, get some airplay and whatnot. Vico is very busy with graduate school right now and I've got several things going on, but we are very much working toward another release. Sonya: What are the future plans for Triple Point? Dan: As of right now, we have about ten new songs done or nearly done. I'm going to work with Tom to incorporate guitar into some of those and possibly write some new ones. Then I will get together with Vico, possibly in a studio if we can find one that we can afford, and record the vocals. We are shooting for a summer 2001 release. Sonya: Are there any other comments that you wish to make?